Today I’m going to tell you everything about Sar Value, I will tell you how to check Sar Value and what is the Safe Sar Value! According to Wikipedia, it is defined that power absorbed per mass of tissue is called Sar Value which is a short form of Specific Absorption Rate. when we talk with anyone then radio waves are emitted and some radio waves are absorbed by the body which is harmful to us if we talk longer. 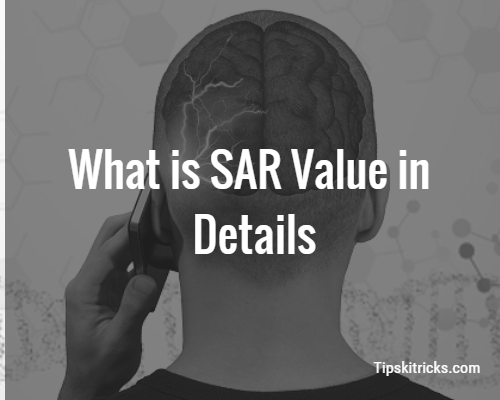 In Simple language, Sar Value is a way to measure mobile phones radiation. So, I think the definition is clear to you, now let’s move to the most asked question related to Sar Value! If you are doing normal talk conversation i.e 15 minutes, 30 minutes or even 1 Hour then it is not dangerous but if you are talking 3-4 hours then it may be dangerous to you. You can wear a headphone when you are doing long talk conversation with your phones, this helps you to keep away from the radiations. While talking you can use handsfree mode so you can keep your phone a little bit away from you and this will save you from radiations. The Phone in the United States must have the Sar Value of less or equal to 1.6W/Kg over the mass of 1 gram of tissue. In Europe, the phones must have the Sar Value of less of equal to 2.0W/Kg over the mass of 10 gram of tissue. How to Check Sar Value of your Smartphones? You can see the Sar Value in the manual of your mobile phones but incase if you don’t see the sar value then you can check sar value of your mobile model here. Usually, these companies produce lowest Sar Value Phones. So, you can buy these company phones at the lowest price. I think you have learned and get each and everything about Sar Value. If you have any question then feel free to comment below.